Thomas Chalkley James was born in Philadelphia, the son of Quaker merchant Abel James and his wife Rebecca Chalkley, the daughter of Thomas Chalkley, a well-known Quaker writer and minister. 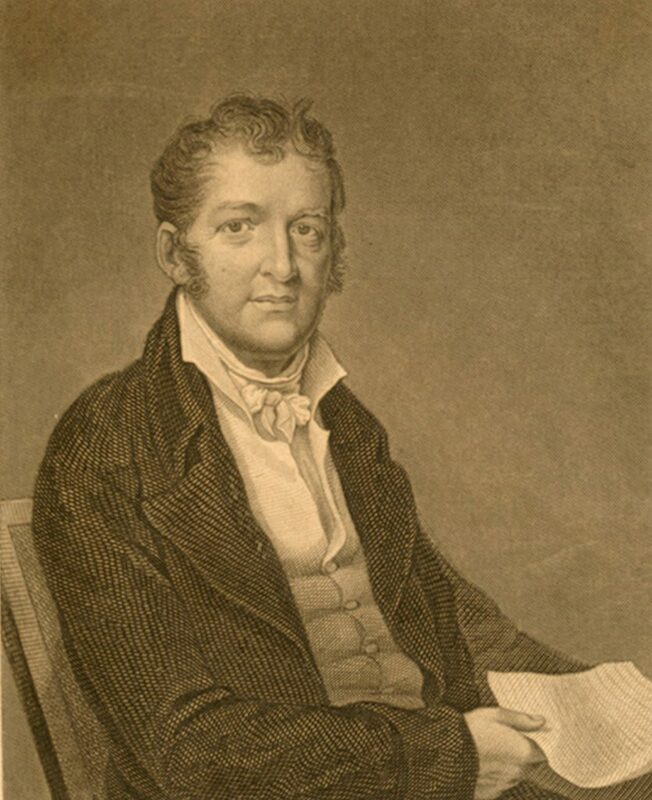 Abel James was also a member of Pennsylvania’s provincial assembly, a friend of Benjamin Franklin, and a member of the American Philosophical Society. Young Thomas Chalkley James received a classical education under historian Robert Proud at the Friends’ school at Fourth and Walnut Streets. Thomas Chalkley James began his study of medicine as an apprentice to Adam Kuhn, then professor of materia medica at the University of Pennsylvania’s medical school. James then entered the medical school, earning his Bachelor of Medicine degree in 1787. After his father’s business failed, James could not immediately finish his medical education in Europe; instead he gained a commission as a surgeon on the merchant ship Sampson bound for China via the Cape of Good Hope. This voyage provided James with the financial resources to study at the Story Street Lying-In Hospital in London and to take courses as a non-degree candidate at the University of Edinburgh’s medical school. When James returned to Philadelphia in the summer of 1793, he joined in the fight against the yellow fever epidemic then raging. He then went into private practice, focusing on obstetrics, and gradually built up a successful practice. By 1802 he was giving a private course of lectures on midwifery at the Philadelphia Almshouse. In 1807 he was appointed a physician to Pennsylvania Hospital, beginning a twenty-five year relationship with that institution. In 1810 James was elected professor of midwifery at the University of Pennsylvania, where he was a popular teacher despite his shyness and lack of eloquence. He was not an innovator in his field, but his practice and teaching gained respect for their careful basis on experience, observation, and the application of existing medical authorities. He edited a few medical works on midwifery, but was more interested in improving the library of the Pennsylvania Hospital. His other medical affiliations included serving as a physician with the charitable Society of the Sons of Saint George and the Philadelphia Dispensary. James was a member of the American Philosophical Society, the librarian of the College of Physicians, and a founder of the Historical Society of Pennsylvania. As a Quaker he opposed slavery and was a member of the Pennsylvania Society for the Abolition of Slavery, but preferred to emphasize not abolition but the creation of a free black community in West Africa as proposed by the Colonization Society of Pennsylvania. James married Hannah Morris in 1802, and they had at least four children. He avoided society in favor of a quiet literary life at home, reading and writing literature and reading the Bible in a variety of languages.